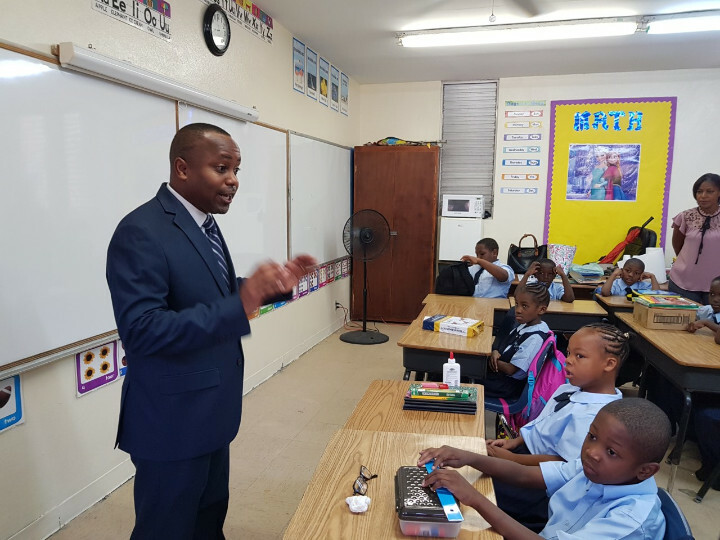 FREEPORT, Grand Bahama - Minister of State for Grand Bahama, Senator Kwasi Thompson was up early on Monday morning and fought his way through heavy traffic to get a first-hand view of how students at the Walter Parker Primary School were settling in on the first day of school. 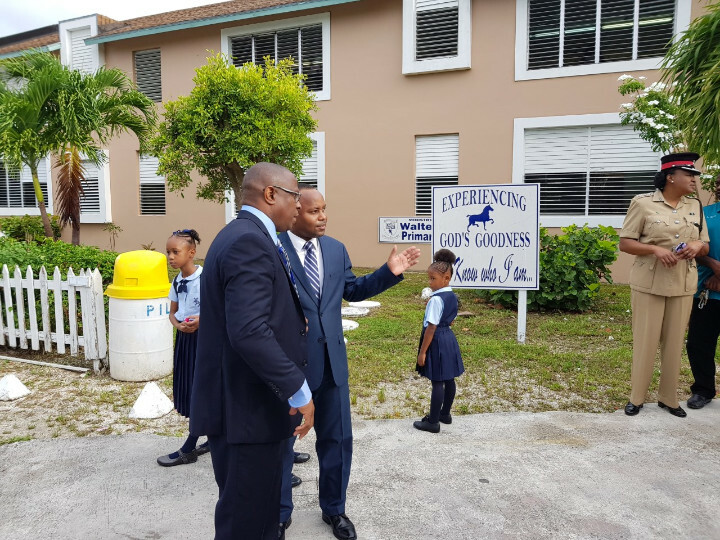 Monday, September 3, 2018 was the official re-opening of school for the new semester in Grand Bahama and Minister Thompson didn’t necessarily make the rounds to all of the school on the island, but made a special stop to Walter Parker Primary because it was one of two schools that still have work to be completed on their campuses. Martin Town Primary (in Eight Mile Rock) is the second school with repair works still to be completed. 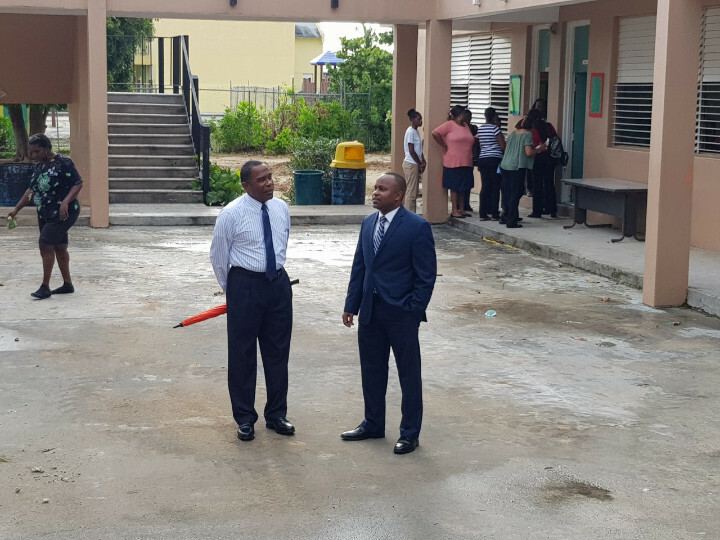 Although work on both schools will not be carried out during school hours, Minister Thompson wanted to ensure that students, teachers and faculty officials were aware of the work still to be carried out. “We wanted to ensure that there was a smooth transition this morning on the first day of school,” said Minister Thompson, during an interview with the media on the school campus. “We wanted to come to Walter Parker Primary in particular, because this is one of the schools where contractors, carrying out their normal repairs over the summer, discovered some real structural problems that the school had. Minister Thompson noted that the contractors are scheduled to continue work at the school throughout the week, after school hours. District Superintendent of schools for Grand Bahama and Bimini, Ivan Butler was also on hand at the school on Monday morning to not only view the work that has been completed thus far, but to also ensure that the first day of school went smoothly for the teachers and students of Walter Parker Primary. Mr. Butler, who represented the Minister of Education, pointed out that all of the schools in Grand Bahama were opened on Monday and that he would do a round of all the schools to ensure a smooth start. He noted that work is also expected to be completed at Martin Town Primary by the end of this week. “Today is a big day for students around the country and we want to welcome all of the students and teachers here in Grand Bahama back to the classrooms,” Minister Thompson told the media. “We also want to welcome all of our parents. We also want to emphasize the importance of education. “The government is very keen on improving education for the country and in particular, improving education for Grand Bahamians. That’s why we have collaborated with Bahamas Technical and Vocational Institute (BTVI) to make certain courses at the Institute free for Grand Bahamians. Minister Thompson said that the first day of school is always an exciting one not just for the kids and parents, but for the teachers as well. He took time to stop in a few of the classrooms and offer some words of encouragement for the youngsters, many of whom looked star-struck when the Minister stepped into the classroom. The Minister encouraged the students to remain focused on their class work during the new semester and to listen to and obey their teachers. He told the students that he wished them well and was praying a blessing over them and their studies in the new term.